MBE. 2nd Lt. Ian Espie Begg, Camerons. MBE 2nd Lt. George Vincent Hooton, Lincoln R.
MBE Lt. Joseph Parker, R.E., T.F. MBE Lt. Frederick Charles Sherwood, Green Howards. MBE Lt. Charles Frederick Weber, M.C., Welch R., attd. Tank Corps. MBE Lit. Frederick Charles Yeo, M.M., Devon R.
1921 Jun 1. To be Members of the Military Division of the said Most Excellent Order. MBE. Lt. John Edward Grundy, M.C., R.G.A. MBE. Lt. John Carbery Preston, Bedfs. and Herts. R.
OBE - Capt Robert Anderson Ransom, P.W. Vols. MBE - Lt. George Craig, Border R.
MBE - Lt. Geoffrey Ibberson, Border R.
1921 Sep 23. 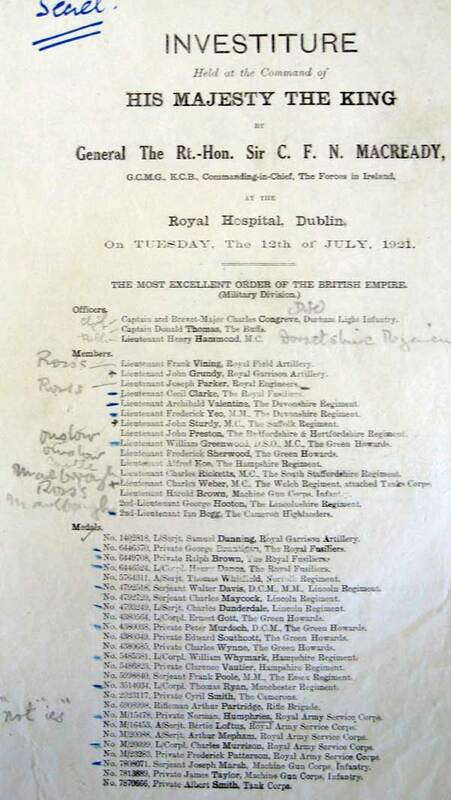 The following appointment to the Most Excellent Order of the British Empire, in recognition of gallant conduct in the performance of military duties: — To be dated 23rd September, 1921. MBE - Lt. Frederic Adrian Joseph Evans Marshall, D.S.O., M.C., The Buffs.